We’ve arrived in Utah for the 2012 Utah 1088. If you’ve landed on this page and don’t know how we got here, you should probably back up to 2012 Utah 1088, Part 1: What? Am I really doing this again?. And if you don’t know what a rally is, check back to 2011 Utah 1088, Part I: Final Preparations. Step 1: Odometer check. This is standard at every rally. The riders are all given a carefully-prescribed route of about 20 miles to ride. At the end, you submit the mileage shown on the odometer, which is compared to the Rally Master’s result for the same route. The result is an adjustment factor that gets applied to your mileage for the rally to determine whether or not you traveled the minimum required miles to be a finisher. As with last year, my mileage was exactly the same as his so I didn’t have to worry about corrections – what I saw was what I got, one less source of stress on the road. Step 2: Self-inspection. We were asked to sign a statement that we were carrying the required equipment – first-aid kit, tool kit, tire repair and inflation kit, flashlight, hydration. If we were using GPS, we stated such and submitted the Unit #. You’ll understand the relevance of this in Part 3 when I get to the GPS-only bonus. And finally, we noted the color of our riding jacket/suit and helmet. This is important to assist in search efforts in case one of us goes missing. Step 3: Photo record. We were then required to have a self-portrait taken on our own cameras. This would be used to help validate which card belonged to whom in case there was a mix-up at the end when the photos were scanned. Not bad, for a last-minute effort. Step 4: Rally towel design. This was new for me this year. Typical of this type of rally is that photos taken for bonus points must include a specific item. Last year it was the rally hat, this year the rally towel. But we were first required to “personalize” it to make it recognizable and individual. We were warned about this in advance, but I hadn’t put any thought into it. So I had to wing it with limited creativity and the tools I had at hand, which amounted to several colors of Sharpies. I decided to replicate the logo for my bike since I knew it was the only one on the rally. Oh yeah, I also added a paw print in honor of Billy, our canine traveling companion. Once we finished up with Check-In, it was back to the room to chill for a while before the Riders’ Meeting. This gave me plenty of TV time, which exposed not only the weather report (HOT! ), but a new challenge – Wildfire! You see, a wildfire had broken out just south of Salt Lake City and there was no sign of imminent containment. Last year’s rally route went south, right through the fire area. Would this year’s route do the same? What sort of variables would that introduce in terms of road closures, traffic, air quality concerns, etc.? Could the legendary deviousness of the Rally Master really have extended to this sort of natural disaster? 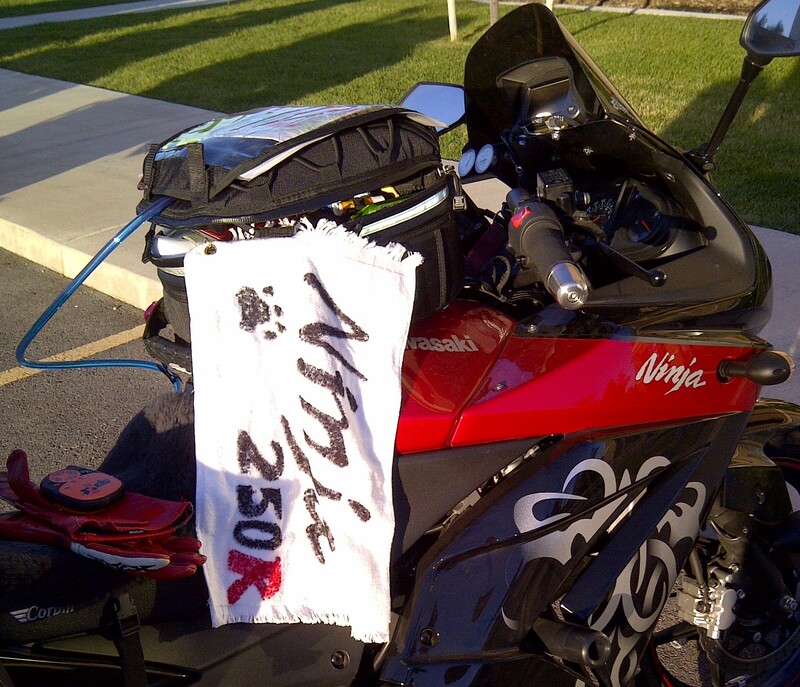 We were asked to bring our finished rally towels and driver’s licenses to the mandatory riders’ meeting. I was unprepared for the level of planning and effort that others had put into their towels – there were bedazzled towels, puff-painted towels, towels with banners and fancy fabric attached, quite an assortment. Oh well, mine met the requirement of being recognizable – this wasn’t the time for towel-envy. After the Rally Master gave some final reminders of rules and answered a few questions, we presented our driver’s licenses and had them sealed in an envelope. More on that later. We then had another portrait session – this time on his camera holding our rally towels. This photo served two purposes – validating the rally towel in subsequent bonus photos, and further assistance in search efforts if one of us went missing. At that point, the route instructions were distributed and we all scurried up to our hotel rooms to begin routing and plotting. This is where the fun really begins. Read through the turn-by-turn instructions (ignoring all bonus questions) and highlight the base route on the map. This gives me an idea of where the Rally Master wants me to go. I was very relieved that the route was sending us north and east, away from the wild fire, which was south. Highlight the mandatory Checkpoint (CP) on the map and note the time window with a black Sharpie – this gives me an idea how much leeway I have on the first leg of the rally. BTW, the CP is worth 3000 points. Enter each bonus question in a spreadsheet with the following information: question #, description, location, requirements (photo, answer question, etc.) and point value. Use the SPOT tracking device – 5000 points. No-brainer, Rich and I always use it when traveling alone, even in the car. Return with your driver’s license envelope intact – 5000 points. No action or decision required, so it gets moved to the other page. The related one, “Return with your driver’s license envelope torn – Minus 6500 points”, also got moved. Have you noticed how important it is to the Rally Master that we avoid interactions with the po-po? Net difference is a whopping 11,500 points! Checkpoint (CP), Evanston WY, 11:00am-12:30pm – 3000 points. This is required, so it goes in the “no option” list. The only role it plays in my routing process is as a Finish spot in Leg 1, and a Start point in Leg 2. Identify the alternate route option (or as I call it, the red herring) and test it with the goal of embracing it or eliminating it. This year’s option was to go to Blanding and back for 9021 points. If you chose this option, you were exempt from the CP requirement. Not a chance. The 620-mile round trip was enough to nix it for me, but add to that heading south into the fire area and the heat of the desert? No thanks. And 9021 points (in the scheme of things) wasn’t nearly enough to be tempting, especially when you also considered the 3000 points you would NOT get for the checkpoint. That left me with 13 bonus opportunities to consider in my routing. Next step is to sort by point value, then divide into four color-coded groups by value – red, orange, yellow, and green. This color-coding carries through on labels I put on the map and route instructions and serves as a quick reference on whether or not I should blow off a bonus if I get behind in time. The green ones are the first to get sacrificed, the yellow and orange ones require more thought, and the red ones are non-negotiable. Accepting the assumption that my first pass will be too long, I have an easy color-coded visual representation from which to start whittling away the options. From this exercise, I found that the “everything” route was calculated at 739 miles and 12:50 hours – way too long. And the obvious bonus to sacrifice was a out-and-back side trip to Jackson WY, which was represented by a yellow pushpin and was worth just 1108 points. Re-running the optimization without Jackson left me with what appeared to be a doable route of 530 miles and 9:17 hours, AND got me to the CP in plenty of time for the scheduled opening. Time to save the master and start honing down my route. Now I split the file into two chunks: Leg 1 (Hotel -> CP) and Leg 2 (CP -> Hotel). The primary benefit of this strategy is this: once you activate a route in the GPS, it always displays the projected time to the end of the route. Since the only times that mattered to me were the CP window and the Finish time, that is what I always want to see represented on the GPS. When I leave the hotel I activate the Leg 1 route, and when I leave the CP, I activate the Leg 2 route. Set the departure time for the Start (7:00am for Leg 1, 11:00am for Leg 2) and the arrival time for the Finish (11:00am for Leg 1, 7:00pm for Leg 2). I also had to enter an arrival time for one of the afternoon bonuses because it wasn’t available after 5:00pm. This results in a warning from the program if the projections have me arriving late. Two of the morning bonuses also had time constraints, but I wasn’t worried about them because I knew I was doing them first and time wouldn’t be an issue. Optimize and Get Directions again. Confirm that I can still do everything as planned and that I’m getting to where I need to be with plenty of time to spare. Export both legs to GPX format, open in Garmin MapSource, transfer to the StreetPilot 2610. That’s that. Go directly east from Salt Lake City to Park City rather than taking a detour south (toward the fire) and coming up from a different direction. There were no bonus points on his suggested route, and I was also able to pick up one of the bonuses that was intended for the second-half of the rally along the way. This was a huge benefit because it would cut out a risky loop at the end of the rally when I might be struggling to make time. Go north after the Oakley bonus and take 80 directly to the CP at Evanston instead of taking the scenic route up Hwy 150, the Mirror Lake highway. In hindsight, I regret making this choice because I had plenty of time and I hear it’s a beautiful road. Go northeast from Montpelier ID and hit I-15 south rather than going down through Bear Lake and Logan Canyon. This was a tougher choice because I know that area is beautiful. But I also know that Bear Lake is a huge summer recreation area, has very restrictive speed limits along the lake, and was likely to be riddled with boat-towing traffic and pedestrians. Not only that, but because of my decision to take the short-cuts on the first half of the rally, I would need extra miles to make the minimum (520) and I wasn’t sure that the Bear Lake route would be enough. I didn’t want to get stuck doing the ride of shame to Saltair and back at the end of the rally just to gather miles, and furthermore, I was concerned that the Bear Lake route would burn up too much time to even have that option. Nope, I-15 was the most time-efficient way to gather miles (or so I thought at the time) so that’s what I decided to do. Last year, I made a list of the turn-by-turn instructions and inserted the bonus instructions, then carried this reference in the map pocket of my tank bag. Sort of a Cliff Notes version of the rally, very much like a roll chart (for those of you familiar with enduro dirt bike events). This was quite effective for my first time, but it hid my map and so I didn’t have the visual overview of where I was and what was coming when. This year, I decided to do things differently and rely solely on the map and GPS. Same as last year, I highlighted my route and then added numbered dots to represent the bonus stops. But then I added labels on which I wrote the pertinent information about the bonus: what it was, what I was required to do. Naturally, the dots and labels were color-coded to match the point value, which gave me an instant visual guidance for making sacrificial decisions if I got behind. Detail of the Greater SLC area. 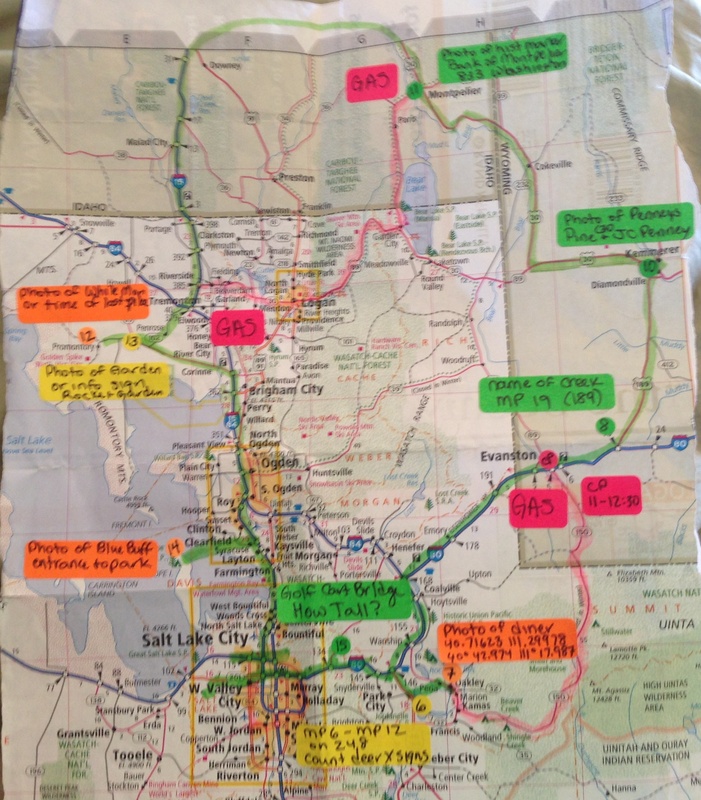 State-wide view of my route – the RM’s suggested route is in pink. The final step was to place the route instructions / bonus questions into sheet protectors and clip them together, binder style, with three small carabiners. These carabiners attach to my tank bag under the map flap and give me easy access to the paperwork when I have to note my bonus information. I write my answers directly on the plastic with a Sharpie and turn the whole thing in at the end – this minimizes the risk of the paperwork tearing, blowing away, or becoming a soggy mess. I was in bed by 11pm, ready for the 5:45am wake-up call and the 7:00am start. I’ll admit that I did wake up at 2:00am re-obsessing over the Jackson WY decision – could I make it if I skipped something else?. I got up and refreshed my numbers (no, it’s worth fewer points than what I’d have to skip), got over it and went back to sleep. 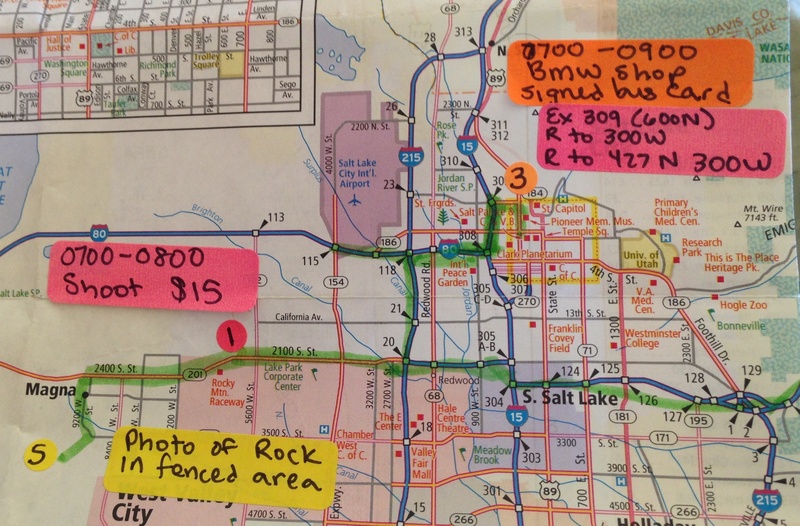 Next up: 2012 Utah 1088, Part 3: Rally Day! This entry was posted on Saturday, October 20th, 2012 at 1:44 pm and is filed under Endurance Rallies. You can follow any responses to this entry through the RSS 2.0 feed. You can leave a response, or trackback from your own site.